The geopolitical importance of the Caucasus and Black Sea region for energy transit has implied that substantial resources are being devoted to the region by outside powers. Economic and political environments are being shaped in a way so as to be conducive to promoting the interests of both the target countries and the interests of those parties that provide assistance in the form of financial aid and political support. Transnational projects such as the integration of electricity systems reflect geopolitical developments accordingly, with underlying economics being incorporated into policy programs which are very much in flux, and which reflect changing political dynamics. Trade in electricity is fundamentally not a zero-sum game of supplier-off-taker relationships, but instead its systemic nature mandates cooperation and coordinated planning and is characterized by economic gains as networks are more widely interconnected, both regionally and transnationally. Electricity network integration initiatives in the Black Sea region and Georgia over the past two decades are reviewed in this article by including reference to political shifts that have overlaid and shaped them, and by focusing in particular on events during Georgia’s transition period. Production and consumption of electric power have to be continuously balanced. There are only a few possibilities for storage through pump storage, for instance, and load factors of power plants and the efficient use of technologies – varying in their investment and fuel costs – are to be optimized. Economies of scale in generation, specific load curves of daily and seasonal demand and natural monopoly-characteristics of transmission infrastructure are further determinants constituting the systemic nature of electricity. As demand and production grow and allow for regional markets to form through interconnection, systemic properties become more important. Gains from trade through interconnected networks occur in the form of capacity sharing, which economize on complementary generation structures (hydro/thermal, for instance) or differing load curves (for example, consumption peaks “flat out” if a system stretches over multiple timezones, reducing requirements for peak generation capacity). The Black Sea region currently encompasses three power system regulatory regimes of standards and operation modes, ENTSO-e (European Network of Transmission System Operators for Electricity) comprising EU-member states and potential candidates of South East Europe, IPS/UPS of the former Soviet Union and now including Russia and the CIS region, and Turkey’s, which is in the process of integrating into ENTSO-e.
IPS/UPS and ENTSO-e network management parameters are described to be very similar in terms of frequencies and capacity reserve management. Integration of these two has been described as being technically feasible. However, continued initiatives to promote integration have not progressed over the past two decades. As energy has successively become an EU priority, energy security has assumed continuously more prominence on the European Union’s agenda both in terms of being a cornerstone of internal market liberalization, as well of foreign energy policy. In parallel to the impressions of the Russia-Ukraine gas disputes of December 2005 and January 2009 and the Russia-Georgia war of August 2008, the EU has launched initiatives such as Black Sea Synergy and the Eastern Partnership. These foreign policy initiatives have over time become increasingly better financed and are intended to draw the EU neighborhood closer to the Union, while spreading EU legislation to the near abroad. In terms of the Black Sea region and energy security, the underlying leitmotif is to secure the Southern Energy Corridor as an alternative supply route for oil and gas from the Caspian region and the Middle East. The EU has launched initiatives such as Black Sea Synergy and the Eastern Partnership. These foreign policy initiatives have over time become increasingly better financed and are intended to draw the EU neighborhood closer to the Union, while spreading EU legislation to the near abroad. Specific projects supported by the European Commission were the Nabucco gas pipeline project and the ultimately successful gas export Trans Adriatic Pipeline project. Both need to traverse Turkey and especially Georgia as the choke point for transit in circumvention of insecure territory and in avoidance of relying on transmission systems passing through Russia, a fact considered to impede security of European energy supply. The European Union’s interests as projected onto the region overlap or follow U.S. strategies, where Caspian energy resources were “re-discovered” in the 1990’s and foreign policy became explicitly and most recognizably directed towards the region under the first George W. Bush Administration, taking office in 2001. The EU’s growing dependence on imported fossil energy and its related desire to diversify sources is mirrored by the Caspian and South Caucasus’ states’ interest to conserve independence obtained after the collapse of the Soviet Union and to raise export earnings by supplying new markets through routes which are not dominated by competing producer countries. It was the common view that integrated grids would benefit all states in the region and it corresponded with declared EU-visions for energy cooperation in the region. Turkey for its part has often emphasized that EU membership will be a driving force for joint energy projects in the region, thus expecting political support in return for its crucial role as a transit hub. In this regard, mixed signals from EU members on accession prospects might condition Turkey to assume positions which balance its interests more widely between actors in the region. Black Sea region potential power exchange directions. USAID. Finally, the role of the Russian Federation and its foreign policy towards the region has been described as varying from liberal expansionism, by way of establishing commercial interest positions within the region, to outright energy hegemonism. The Ukrainian gas disputes and the Georgian war of 2008 represent key events shaping the perception and interpretation of Russia’s ambitions and means of achieving them. Post-1991 cooperation initiatives in the Black Sea region may be described to have crystallized most visibly in the form of the Black Sea Economic Cooperation (BSEC) organization, which was founded in 1992 and today comprises Albania, Armenia, Azerbaijan, Bulgaria, Georgia, Greece, Moldova, Romania, Russia, Serbia, Montenegro, Turkey and Ukraine. While the importance of the organization has diminished with the integration of countries towards the European Union, it continues to work as a coordination platform with an emphasis on regional projects. Starting in 1996 the Russian Federation promoted the improvement and establishment of power inter-connections between member states with the goal of creating the so called Black Sea Energy Ring. The proposal was taken up by BSEC member states and further discussed within expert groups; data to study the feasibility were shared. It was the common view that integrated grids would benefit all states in the region and it corresponded with declared EU-visions for energy cooperation in the region. Again in 2004 Russia’s RAO-UES proposed a project for reconstruction and further extension of the already existing grid infrastructure between Russia, Georgia, Turkey and Azerbaijan. The “South Caucasus Project” called for implementation in synergy with EU projects in the region. In parallel, USAID (U.S. Agency for International Development) launched a similarly structured regional initiative in the same year, involving system operators of the Black Sea region, including IPS/UPS. This USAID-supported project, named Black Sea Regional Transmission Planning Project (BSTP), got ultimately more support, crucially by Turkey, which also planned to join ENTSO-e. Even though the Russian side originally sought to combine these two almost identical projects, it was left with the position of just a participant party initially and was ultimately excluded from the implementation phase. In its early stage the USAID-sponsored BSTP project assembled the transmission system operators (TSO’s) of Armenia, Bulgaria, Georgia, Moldova, Romania, Russia, Ukraine and Turkey and beginning in 2004 combined a series of capacity building programs with technical studies on opportunities for increased power exchange in the region. Fundamentally, these studies, conducted with the goal of lowering production costs and spare capacities, highlighted the possibility for increased East-West flows from Russia and Ukraine and to a lesser extent from Georgia and Azerbaijan towards Turkey and towards ENTSO-e networks. Substantial cost savings were identified, but only as long as flows were unrestricted and capacities dispatched in coordination. With regard to transmission capacities, the Georgia-Turkey link was identified as being too weak, requiring additional transfer capability. Successively, reports modeled the inclusion of substantial renewable generation, first of all from wind in Romania and hydro in the Caucasus. While work with a regional view continued, in April 2009 the TSO’s of Georgia, Azerbaijan and Turkey and the governmental United States Energy Association (USEA) signed a memorandum of understanding to develop a common transmission system model for the three countries, named the Power Bridge Project, as a basis for government planning in furthering regional trade in electricity. As per the memorandum, participation of any third country required the agreement of all three countries. Further working meetings saw the attendance of the World Bank Group’s International Finance Corporation. By 2000, for instance, Georgia was the largest per capita recipient of U.S. foreign assistance with 200 USD (160 times the per capita amount devoted to Russia). An earlier study, conducted in 2007, which had been financed by the German government-owned development bank Kreditanstalt für Wiederaufbau (KfW), focused on the Georgian and Armenian electricity sectors. The scope of its analysis of feasible transmission extensions had included the prospect of trade with Iran and Russia. The USAID Power Bridge Project included a technical analysis of this KfW study in its later reports. However, although it was recognized that the North Caucasus electricity grid would be impacted by new infrastructure in the south, Russian TSO’s remained excluded, because at this stage, political conflict between Georgia and Russia had produced a strongly Western-leaning administration in Tbilisi. Consequently, in early 2010 KfW, European Investment Bank (EIB) and European Bank for Reconstruction and Development (EBRD) with the participation of Development Bank of Austria (OeEB) agreed to co-finance an upgrade to the internal transmission grid of Georgia and to construct new HVDC interconnections with Turkey. This infrastructure will allow for the export of new hydro-based generation in Georgia and thermal-based electricity from Azerbaijan after 2013. The political and economic events which led to the shift in focus from a regional perspective to a sub-regional one excluding Russia can be explained by concurrent developments in Georgia. After the collapse of the Soviet Union, Georgia’s economy fared worse than most of the countries in transition. By 1995 its GDP had dropped to a level of just 28% of its 1990 GDP and was still below 80% of that value in 2012, worse than both resource-rich and not resource-rich Eastern and Central Asian CIS countries. The sharp economic contraction occurred despite substantial economic assistance by international financial institutions and bilateral development aid. By 2000, for instance, Georgia was the largest per capita recipient of U.S. foreign assistance with 200 USD (160 times the per capita amount devoted to Russia). Similarly, the energy sector, despite being targeted by foreign aid programs, remained dysfunctional during the 90’s and early 2000’s with frequent cut-offs and deficient internal generation covered by imports that could often not be paid for. Projects and Commitments in Georgia. World Bank. The power sector and the economy as a whole were repeatedly afflicted by gas and electricity cut-offs from Russia which occurred in parallel to territorial disputes over South Ossetia, Abkhazia and incidents involving Chechen guerrillas operating in Georgia. Separately, the Nagorno Karabakh conflict between Azerbaijan and Armenia impacted import (and transit) routes between Georgia and Azerbaijan. Russia’s state utility RAO-UES (today Inter RAO) acquired Telasi in the summer of 2003, months before the Rose Revolution, which brought about a political transition from a post-Soviet leadership to an explicitly pro-Western government. Furthermore, cronyism and criminal networks are described to have shaped the private sector to a large extent, exemplified in the power industry by the privatization of the Tbilisi power utility Telasi. In 1998 the U.S. based independent power company AES acquired Telasi together with a number of thermal and hydro generation assets. Successively, AES was unable to improve electricity distribution, could not collect payments and became involved in court cases. Reports of illegal electricity re-export schemes involving AES and the killing of personnel preceded AES leaving the country and divesting its assets. Russia’s state utility RAO-UES (today Inter RAO) acquired Telasi in the summer of 2003, months before the Rose Revolution, which brought about a political transition from a post-Soviet leadership to an explicitly pro-Western government. Remarkably, the newly Russian-owned Georgian power company was commercially successful in raising payment rates and improving the technical distribution system as political relations between Russia and Georgia continuously deteriorated. This deterioration was characterized by energy supply cuts, acts of sabotage on electricity and gas imports from Russia, and Gazprom pressing for gas price increases from subsidized levels towards Western market prices. In spite of the clear shift in the geopolitical orientation of the new government, after the Rose Revolution the administration continued to privatize gas and electricity sector interests, including to Russian controlled entities. The year 2006 marks a relevant shift in Georgia-Russia relations and the beginnings of a pronounced energy policy of the Georgian government. Early in 2006 explosions at two gas pipelines connecting Georgia and Russia openly illustrated the country’s dependence and vulnerability. This was especially a challenge for the Saakashvili government, which had made reliable power supply a prominent topic of public discourse. The ensuing 2006 resolution on the “Main direction of State Policy in the Power Sector” and the “Renewable Energy 2008” program of the Georgian government represents a legislative starting point that established policies of import diversification and development of indigenous renewable energy sources, represented mainly by the vast untapped hydropower potential. This hydro-power development strategy was carried out in line with a general economic policy focusing on radical liberalization. 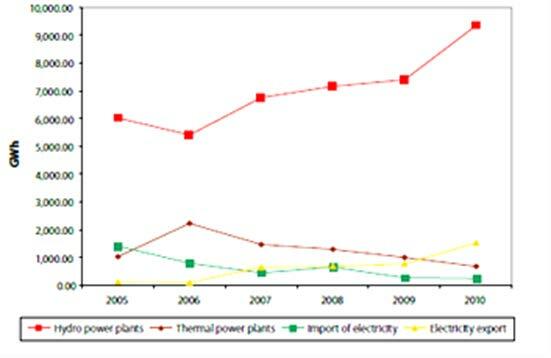 Electricity generation from hydro power markedly increased from 2006 onward, thereby replacing thermal generation and making Georgia a net power exporter for the first time in 2010. In fall of 2007 Georgia and Turkey signed a memorandum of understanding on interconnection of power sectors of the countries. This was followed up by further agreements as well as the USAID-sponsored Power Bridge Project mentioned above. At the same time, financial assistance towards Georgia, having already been substantial throughout the transition period, reached a new level after the Georgian-Russian war over South Ossetia in August 2008 and following the Russia-Ukraine gas dispute of January 2009. A donor conference chaired by the European Commission and the World Bank following the war mobilized 3,44 billion Euros, mostly from OECD countries and international financial institutions such as EIB, EBRD, World Bank, IFC and Asian Development Bank. Funds allocated to Georgia – among others – increased as the EU launched the Eastern Partnership initiative in 2009 and as it stepped up efforts to support the Southern Corridor as a consequence of the Ukraine-Russia gas dispute of January 2009. Georgian electricity generation by source. Energy Charter, 2012. Programs funded under Eastern Partnership instruments focus to a great extent on institution building and power-market related reforms designed to draw Georgia closer to the EU regulatory sphere. For example, programs are targeted at Georgian regulators to adopt EU standards in market regulation (unbundling of vertically integrated undertakings, tariff methodologies, etc.). Additionally, investments in generation and transmission infrastructure are carried out to a considerable extent by grants and loans from international financial institutions. Overall, despite the multiplicity of donors, their initiatives seem very much coherent and complementary to each other in terms of developing a functioning export oriented hydropower based electricity sector. Electricity generation from hydro power markedly increased from 2006 onward, thereby replacing thermal generation and making Georgia a net power exporter for the first time in 2010. On 11th December 2013 the power connection between Turkey and Georgia under the Power Bridge Project was inaugurated with first electricity exports from Georgia via this new link expected to commence in the spring of 2014. Prior to the commissioning of the new inter-link, the legislators had ratified an agreement between Turkey and Georgia on the principles under which trade in electricity is to occur. Importantly, the transmission capacity will grant priority access to new power generation from renewable sources and will thus serve as the export revenue conduit for hydro projects developed in Georgia. One could imagine that if Armenia is able to escape its isolated position by re-establishing economic ties with some of its neighbors, it might well become part of a more interlinked power market, as could be the case for Iran. Foreign investments in Georgia’s hydro sector have been impressive over the previous years, with specific private investments originating from India (Tata Power), Korea (KEPCO), Norway, the EU and Turkey, among others, testifying to the fact that the donor-advised policies were able to make the country an attractive destination for FDI. Hydro projects – either planned or already under construction – will produce substantial excess generation for export during the summer months, though current links will have to be extended in the near future to be able to accommodate all capacity additions. During winter months, when hydro generation is low, transmission lines between Georgia and Turkey will be free for transfers from other regions. Currently, Georgia imports winter deficit power mainly from Russia, as it is the lowest cost source. It remains to be seen whether the Power Bridge Project, which was designed without involvement of Russian system operators, will lead to a severing of links between the North and South Caucasus (if Georgia joins ENTSO-e, as planned, this will be more likely), or whether commercial interests will promote more trade involving Russia as well, realizing what was originally envisioned by RAO UES as the South Caucasus Project. Overall, developments will continue to reflect political events in the region. For instance, one could imagine that if Armenia is able to escape its isolated position by re-establishing economic ties with some of its neighbors, it might well become part of a more interlinked power market, as could be the case for Iran. In such an event, earlier regional studies could be “taken out of the drawer” again. Daniel Tappeiner is an MA student in the ENERPO program at European University at St. Petersburg. Tsantoulis, Y. 2009. “Black Sea Synergy and Eastern Partnership: Different Centers of Gravity, Comple-mentarity or Confusing Signals?”. Policy Brief. International Center for Black Sea Studies.